$864,800 Stunning 2 Bed Condo Corner Suite In Oakville! "High Ceilings And Desirable Split Layout!" 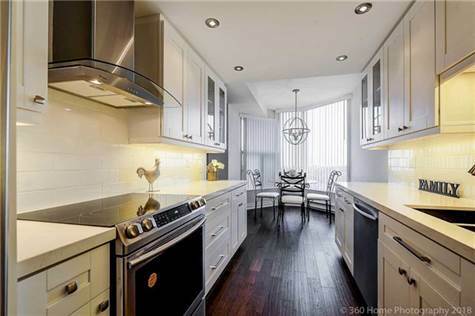 Stunning 2 Bedroom 1445 Sq. Ft. Corner Suite With High Ceilings And Desirable Split Layout! Incredible Unobstructed Panoramic Views Of Lake, Niagara Escarpment And City Skyline! Total Reno: New Smooth Ceiling, New Crown Mouldings, All New Doors, Door Jambs/Casings And Baseboards! New Wood Kitchen Cupboards, Ceiling Raised To Accommodate Taller Uppers! Small Shower In Ensuite Bath Deleted To Enlarge Walk-In Closet!